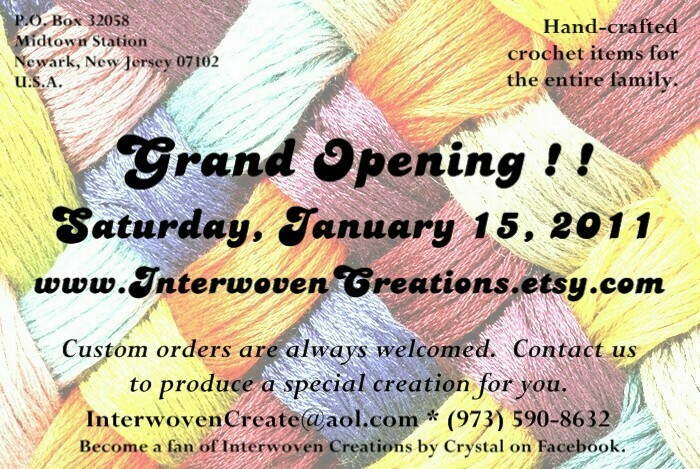 The grand opening weekend of our Etsy shop runs from Saturday, January 15 to Monday, January 17. (www.InterwovenCreations.etsy.com) So, don’t forget to do some shopping on your day off of work for Martin Luther King, Jr. Day. As most of us do when we are excited about an event, we have been counting down the days. Today makes 6 days until… We are excited that all the aspects are coming together fabulously. I do not get the opportunity to express my creative side when doing my day job. You can only go so far when appearing in court. My “pageantry” (as my husband calls it) is stifled. Soon, it will be free! Free to show off! Free to be pageantry-ish! There’s plenty to be done. Plenty of stitches to crochet. Plenty of items to finish. Pictures are coming soon….